After solely backpacking in the Daniel Boone National Forest or the Big South Fork National River and Recreation Area for the past year, I took a break from exploring the creeks, hollows and clifflines of the Cumberland Plateau with a three-night trip to the Joyce Kilmer-Slickrock Wilderness Area of the Nantahala National Forest, located in western North Carolina. Aided by a topographic map and an excellent guidebook (Hiking Trails of the Joyce Kilmer-Slickrock and Citico Creek Wildernesses by Tim Homan) I decided on hiking a combination of trails that would form an approximately 18.5 mile loop and, I hoped, provide me with a good sampling of what the 33,620 acres contained. Planning your hike and hiking your plan is basic backpacking common sense, but wilderness areas and the primitive standards to which the trails are maintained can sometimes turn even the best of plans upside down -- massive deadfalls, dense overgrown sections and eroded tread can turn a hike into a yard-by-yard battle that makes a Tough Mudder race seem like a relaxing alternative. Even the most conservative miles-per-day estimates can quickly become wishful thinking. "Trails in designated wilderness areas are like a box of chocolates, you never know what you're gonna get." Fortunately, the obstacles on the trails that I hiked were infrequent and relatively easy to traverse, even with a 25-pound backpack. Although some sections of the trails were steep (there was an approximately 3,000 foot difference in elevation from the lowest and highest points of my hike), trekking poles and a reasonable pace -- as well as mild weather -- mean that the periods of strenuous exertion on my hike were kept to a minimum. 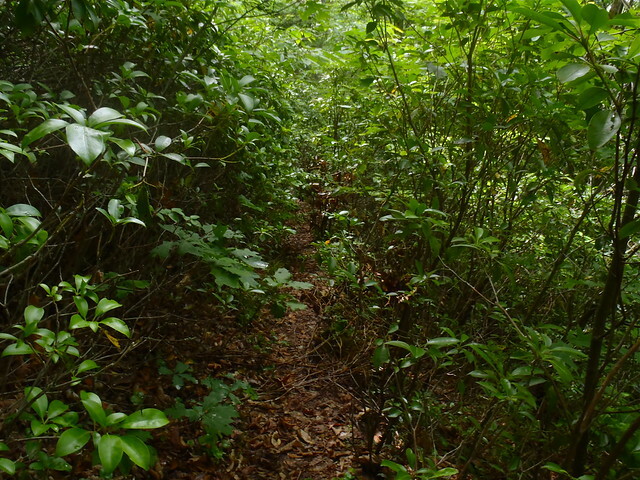 The trails were maintained to the expected primitive standard, which I find to be the most preferable as it creates a feeling of immersion in the landscape that heavily graded trails as wide as sidewalks struggle to provide. I parked at the Jenkins Meadow Trailhead around 4:30 p.m. my first day, tried to ignore the broken auto-window glass on the pavement, and began a half-mile walk on the Joyce Kilmer Memorial Forest Road to the trailhead for the Joyce Kilmer National Recreation Trail (no overnight parking allowed at that trailhead), which would connect with the Naked Ground Trail and the other trails which I would use to loop back to my vehicle. 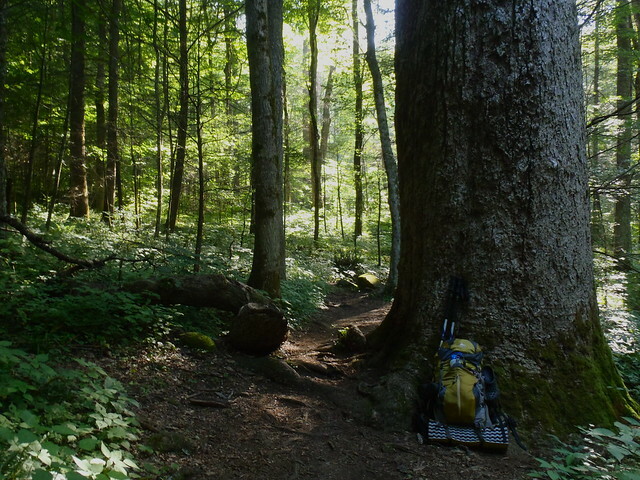 During my ten minute hike to the trailhead, two cars passed me on their way out and as I began hiking the Joyce Kilmer National Recreational Trail I could hear other hikers exiting and leaving in the only remaining vehicle in the parking lot, leaving me alone with a two-mile trail that passes by a stunning amount of massive trees. I camped at a fairly well-used campsite -- which, despite its use, appeared to be in great shape compared to the scorched earth and broken glass of many Red River Gorge campsites -- after about three miles of hiking, then prepared and ate dinner alongside a nearby stream. Tomorrow I would begin the climb (about 2,500 feet over four miles) to the ridgecrest and junction with the trail I would hike for the next leg of my trip. The pleasant scenery kept my mind off the burning in my quads, and the sound of rushing water in the stream roughly paralleled by the trail drowned out my heavy breathing. Upon reaching the junction, I paused for a lunch break and drank the water that I had filtered from a spring that was a 1/4 mile below the crest of the ridge. 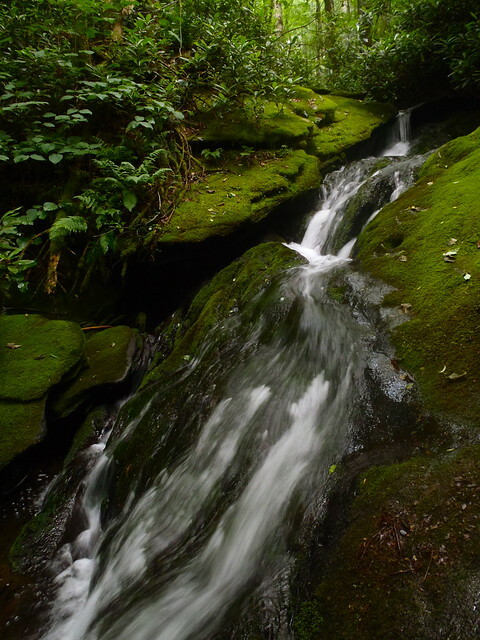 It was great to not have to haul water up the entire trail, since according to the guidebook a reliable spring was located at such a convenient place. After finishing lunch, I soaked in the south-facing view for a few moments before continuing along the ridge to the area I was planning on camping at and the overlook that was located at the end of a short spur trail near where I planned to camp. Once I had checked out the view, and instantly decided that my dinner would be most enjoyable if consumed while perched among the rock outcroppings and watching the sun set, I returned to the area where I would set up my tent and relax in my hammock for a few hours. I had plenty of warning, both visual and auditory, that a storm was approaching so I set up a small tarp over my hammock and waited out the brief storm in utmost comfort. The next day, I forfeited some of my elevation in order to connect with the next section of trail I would need to hike to complete my loop. The trail that I used to do this, Deep Creek Trail, was overgrown in many places but other than that was relatively non-remarkable. I paused for lunch beside the creek and decided to spend some time exploring the creek before continuing. Perhaps the hardest part of the trip was not exploring this creek for the rest of the day -- sluices, drops and cascades separated pools of varying sizes and each one I encountered seemed more spellbinding than the previous. As expected, I reached the next trail junction in the late afternoon and hiked for a few more miles before setting up camp. A light, but steady, rain rolled in not too long after I pitched my tent and, once again, I found myself in a hammock listening to raindrops fall on sil-nylon. Not quite a tin roof, but definitely not the worst sound I've heard. I prepared and ate my dinner under the tarp before settling into my tent for the last night of the trip. 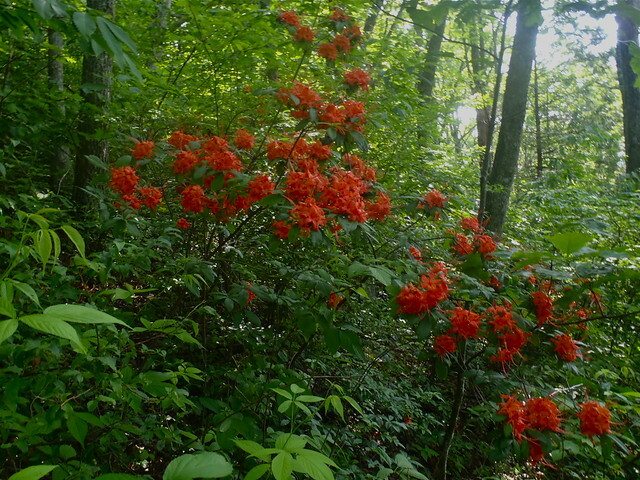 The trail back to my vehicle passed by several nice azaleas in bloom, as well as several large oak trees. I also encountered the only two other hikers, aside from those at the beginning of my trip that were getting ready to leave, that I saw on my trip. Although it will probably be a few months, I am eagerly awaiting my next trip to this area. 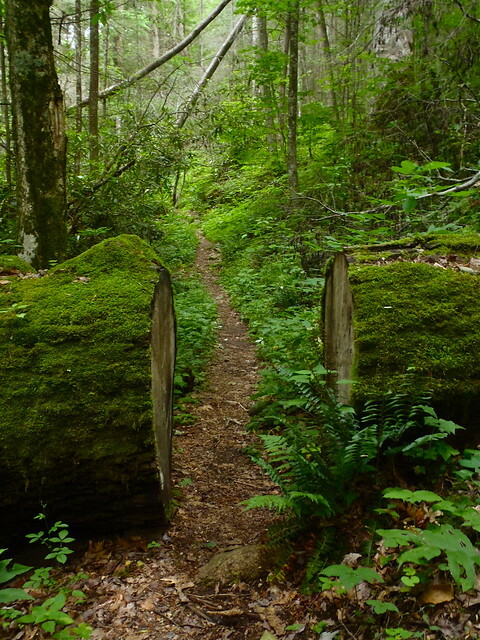 There are over 120 miles of trail in the combined wildernesses of Joyce Kilmer-Slickr and Citico Creek, and my trip gave me a solid foundation to plan future hikes. 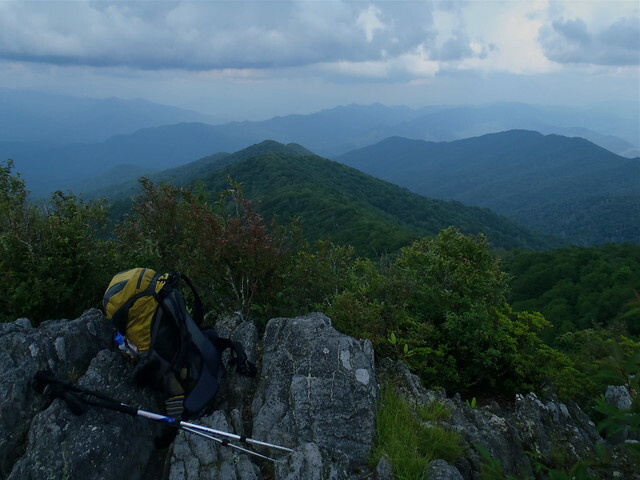 The mountainous landscape was an enamoring contrast to the Cumberland Plateau I am used to and and I look forward to taking the time to do some off-trail exploration there in the future. Needless to say, I'm eager for my next backpacking trip, wherever it may be, but there's something about this area that will likely compel me to overcome my aversion to driving long distances (in my mind, I'd rather drive 1-2 hours and be three hours into a hike and exploring up a creek I've been looking at on a map for a few weeks, than drive five hours before I start hiking) and make getting down here again a priority. Awesome trip report Mark W. It's trips like this that I dream about. Thanks for sharing! Excellant report! thanks for sharing. thanks for the trip report and awesome pictures of that area. I was up 2 weeks ago just for a quick overnight on the BMT. It was my 1st time in that area and I want to go back just like you do!! I have had the guidebook for about five years and still have not had the chance to go. Thanks for the great description. Now I am itching to go even more! Might wait for the temps to drop below 1000 degrees though. Very nice!! I wish the Smokies were just a bit closer. What route did you do for that hike? 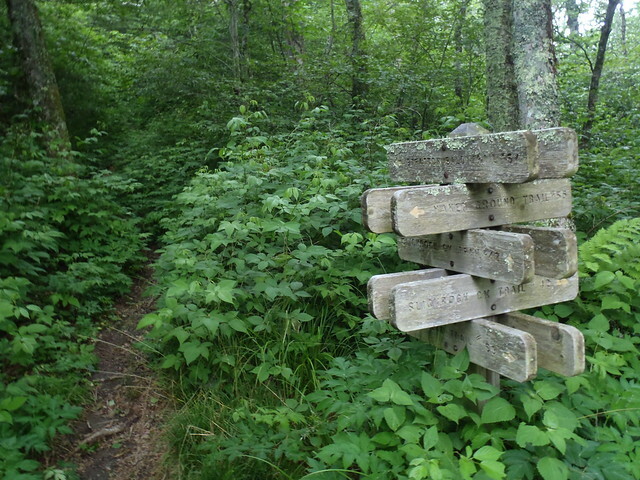 I looked at doing a hike on the BMT/Fodderstack Trail and then connecting with the other trails to make a loop. We were probably there about the same time -- I was there from June 13-16. You really should get down there once the weather turns around! If you want more details about my route feel free to PM me. Also, you might want to check and make sure your guide is the third edition, which was released in 2008. There were a few minor re-routes that occurred pre-2008 and that is why the third edition was released, from my understanding. If you don't have a map yet, I would recommend the National Geographic Trails Illustrated map "Fontana and Hiawasee Lakes" which includes the Joyce Kilmer-Slickrock and Citico Creek Wildernesses. It was what I used on my trip and paired with the guide I never felt under-informed. You and me both! 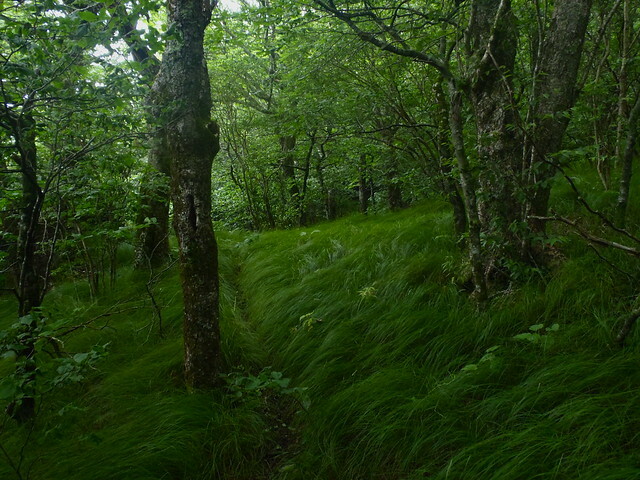 But I suppose the grass is always greener in the other landscape. I'm sure if I spent most of my time hiking down there I would start to crave arches, sheer cliffs and the waterfalls that pour over rockshelters into sandy, green-blue plunge pools after a while! We were meeting up with some folks from hammock forums for a show and tell of hammocks. We only did 3 miles to get to the campsite by Slickrock Creek. We came in from hwy 129 by the Calderwood Lake. We started out on the Slickrock Creek (trail 42) trail for .6 mile then took the Ike Branch (trail 45) trail 2.2 miles, then .2 miles down the Slickrock Creek trail to where everyone was camping. the hike in wasn't bad except for one area. In 1/4 mile you have an elevation gain of 400 feet. No switchbacks at all, it just goes straight up. Ewker, sounds like a good trip -- I'd wanted to get down by Slickrock Creek but from where I was coming from (Joyce Kilmer Memorial Forest trailhead) I would have had to lose most of my elevation just to turn around and gain it all again. I'd thought about doing a longer loop that would have taken me down Slickrock Creek Trail from Naked Ground and then connect with Windy Gap Trail and Hangover Lead North Trail to form a loop, but that would have added more mileage than I wanted to commit to on my first visit to the area. I know what you mean about the steepness of some of those trail sections. Fortunately, I was mostly going down the steepest sections and had more mellow grades for most of my uphill hiking. My gf and I want to go back but only want to do 7-8 miles a day. I sent an email to a guy who knows that area like the back of his hand in hopes he may be able to tell us some nice routes that will work with the short mileage we want.